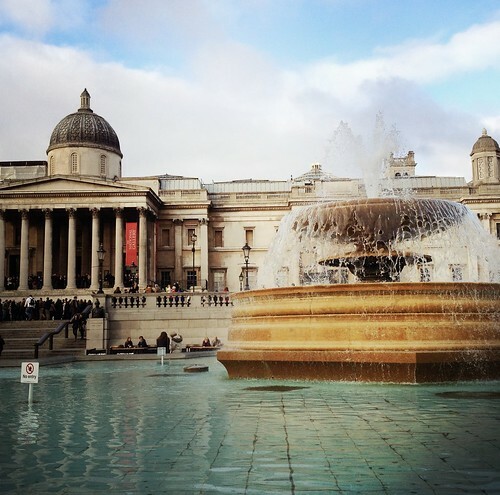 Trafalgar Square, a photo by PhotoPuddle on Flickr. Last weekend I got the chance for a bit of might be referred to as "Me Time". I was meeting some friends in London for dinner and drinks in the evening so I thought I would make the most of my train ticket and go up early. I spent the day basically taking photos and shopping. This photo is my favourite of the day. It sums up why I love iPhoneography and why I love my phone so much now I could actually marry it! I took this using the Hipstamatic app and I think the colours are just really beautiful. I also really like the pattern the water in the fountain is making. I am so pleased with how this picture turned out. I hope you like it too.